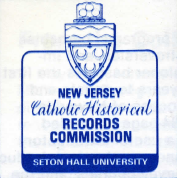 The NJCHC has digitized foundational documents of the Commission including the minutes from the early meetings and early correspondence between Seton Hall University and the Archdiocese of Newark. There are also images of brochures of the many past Commission sponsored symposia, as well as a parish survey from the initial preservation efforts of the Commission. All of these documents are found here. “Capturing the Usable Past;” March 21, 1981. “New Jersey’s Black Catholic Heritage: Discovering Our Past in the Present;” January 31, 1991. “Collecting, Preserving and Writing Catholic History;” March 30, 1993. “Post World War II Immigration from the Caribbean Islands and Its Impact on New Jersey Catholic History;” March 12 , 1994. “Women Religious and Ministry: Exploring the Catholic Experience in the State of New Jersey;” October 28, 1995. “Writing Parish History;” September 28, 1996. “Catholic Education in New Jersey: Some Chapters of the Story;” April 25, 1998. “Catholic Higher Education for Women in New Jersey;” March 25, 2000. January 30, 1976; Important business from this meeting included discussion of the possible co-sponsorship or affiliation with the New Jersey Historical Commission and/or the New Jersey Historical Society. The survey of archdiocesan records was also discussed, and funding methods were brought up. The Oral History program has interviews lined-up to begin the project. March 16, 1976; New members of the committee are added and the budget for 1976-1977 is discussed. Financial support is suggested from other sources. The name of the commission is finalized as The New Jersey Catholic Historical Records Commission. The commission decided to create an advisory board comprised of Bishops and educators/historians of New Jersey. The need for a consultant to overview the archdiocesan archives was also discussed. April 13, 1976; More new members are present at this meeting. The commission decides against a tax-exempt status but a derivative status from the diocese and university. The search for a working space continues, and they decide to create a logo. The Knights of Columbus and the Catholic Daughters of America are being contacted for monetary support. A reception was agreed upon in the future to encourage donors. The preparation began to announce the creation of the Commission to the other dioceses, and to ask for histories from all dioceses. Finally, new acquisitions were announced. May 19, 1976; The Knights of Columbus made a pledge to the Commission. Further efforts to receive diocesan materials were discussed. The logo is in the design phase. Members were suggested for the advisory board. Publicity and public relations strategy was briefly discussed, and more grant sources were suggested. Sub-committees were created for acquisitions policy, grants, technical services, space and facilities, and publicity. July 7, 1976; More discussion occurred for the cooperation of all the dioceses and pastors in NJ, as well as more letters that will be sent out to each diocese. A revised budget was suggested, and the nature of the advisory board was still being decided. September 15, 1976; The Catholic Daughters of America made a donation to the Commission. Other topics of discussion included: the need to finalize a workspace; mailing out the revised budget and the possible final members of the Commission and advisory board; the Oral History project will soon begin; there will be a press announcement of the creation of the Commission. September 28, 1976; Rev. Francis Seymour, archdiocesan archivist of Newark, was welcomed. The press conference and announcements were complete. Questions arose about how the grant money should be processed and applying for a tax-exempt status. Space was trying to be added in the University Library for the Commission. The advisory board was renamed to the Board of Consultors. More invitations were suggested for possible members. The contract for the transfer of the archdiocesan archives to SHU is complete. Finalization of the transfer is still in-progress. October 26, 1976; The Commission will be interviewed WMTR of Morristown. The financial report suggested that the University supervise future grants. The members of the Board of Consultors were further discussed and edited for invitation status. Proposals for grants will be reviewed by the Committee. A memorandum of the relationship of the Commission to University and the Archdiocese is to be created. November 23, 1976; The New Jersey Bicentennial Celebration Commission could not offer funds. Discussion of the list of possible consultors was postponed until the next meeting. Revision was suggested for the Memorandum of Understanding. January 18, 1977; The official contract for the transfer of the archdiocesan archives to Seton Hall is complete and signed. Questions arose about what materials will be transferred, however. The Commission account is going to be managed through the university, which houses the Commission. Parish directories are not being donated as much; it was stressed to remind parishes to donate. March 8. 1977; Plans and programs are discussed for the 125th anniversary of the archdiocese of Newark. A policy statement is drafted, and members of the advisory board are invited to join. April 19, 1977; The period of the anniversary celebration was decided for October 1, 1978- December 8, 1978. Other plans were discussed including the publication of Bishop Bayley’s diary. May 20, 1977; Discussion of the possibility of participating in the ACHA spring meeting. The commission is still searching for a publisher for the Bishop Bayley’s diary. More discussion about which records should be transferred or not. The sub-committee is preparing grants for the Commission. June 21, 1977; The Commission decides to publish the Bayley book themselves due to low interest. The statement of access is edited. July 27, 1977; Harvard printing company offers to publish the Bayley diary; prices are questioned. More grants sources are brought up for application. A fund raising and public relations committee was discussed. September 16, 1977; The Commission will participate in the ACHA meeting. There was more discussion about the price to publish the Bayley Diary. NHPRC agreed to offer funds with conditions; the university is being consulted for grants advice. The oral history project is still under way. October 11, 1977; The Commission received advice on grants from the university’s office of grants. Microfilming and the oral history project was discussed, as well as a logo and publicity issues. December 6, 1977; More discussion of grant applications and drafts. More microfilming projects are addressed including The Monitor. Catholic News was trying to be obtained, as well, for microfilming. January 10, 1978; Microfilming parish records is addressed without expensive, outside assistance. More grant applications are sent out, and an intern will be assisting the Commission. February 21, 1978; The Commission received news from grant sources, both good and bad. Funds have to match a NHPRC grant and were quickly being sought after. A review of the Commission progress was suggested. April 25, 1978; Additional grant money is still sought after and discussed. More foundations were suggested. A tour of the library followed that showed the progress of organizing records of the Commission. May 8, 1978; More grant applications, as the Commission brainstorming on other sources for funds. A public program that advertises the Commission’s holdings and efforts was decided on and to be planned out in more detail soon. June 28, 1978; The NHPRC grant did not come through; a Boston archive was to be consulted for advice. More formal cooperation between the dioceses was suggested in order to legitimize the Commission’s efforts and grant requests. Clearer processing guides and a budget would be created as well to aid in funding applications. Money to publish the history of the Newark Archdiocese is to be discussed. July 17, 1978; A visit to the Boston archives is suggested for advice on grant proposals. The publishing of the history of Newark for the anniversary is still debated. More quotations for publishing are sought after. It was decided that clear relationships with the University and the dioceses must be established in order to prove the sincerity and longevity of the Commission for grant applications. October 24, 1978; More grant proposals are being sent out and a microfilming plan is being drafted. More space for Commission operations was discussed as well as the possibility of a newsletter. The Bishops of Newark would be available on December 3. The Commission discussed awards for work on publications and possible membership of the Commission in professional organizations. December 5, 1978; More Bishop Bayley records are to be xeroxed from the Baltimore archives. Office space and relocation is discussed inconclusively once again. A report of the Commission is created for publicity and intent for the public. Presenting awards and the decision to join professional organizations is announced. The logo is still undecided. November 6, 1975; Letter from Msgr. Thomas G. Fahy to Archbishop Gerety asking for support for the transfer of Archdiocesan archives to Seton Hall. December 30, 1975; Letter from Msgr. Field to the Most Reverend John J. Dougherty concerning adding new members to the Commission. Proposed draft from Archbishop Gerety to all of the parishes of the diocese to allow the NJCHRC to copy the sacramental records of each parish. March 19, 1976; Letter from Bernard Bush, Executive Director of The New Jersey Historical Commission, to Msgr. Field congratulating him on the Commission’s work. March 24, 1976; Letter from the Auxiliary Bishop of Newark (draft?) to The Most Rev. George W. Ahr, S.T.D. About the formulation of the NJCHRC and a request for the transfer of diocesan files. July 16, 1976; Letter (possibly a draft) from the Bishop of Paterson, Lawrence B. Casey, requesting cooperation of diocesan transfer of historical documents to Seton Hall. September 14, 1976; Letter from Peter L. Gerety, Archbishop of Newark, to fellow clergy asking for cooperation with the Commission. Draft for the proposed by-laws for the NJCHRC outlining the purpose of the Commission and membership responsibilities.